Stećci–Medieval Tombstones Graveyards were inscribed on the UNESCO World Heritage List on July 15 2016, at the 40th session of the World Heritage Committe in Istanbul. The inscription of Stećci on the World Heritage List was the result of the 6 years long work of the experts from Bosnia and Herzegovina, Croatia, Montenegro, and Serbia on the preparation of the Nomination File and joint efforts of all four countries to preserve their common cultural heritage. 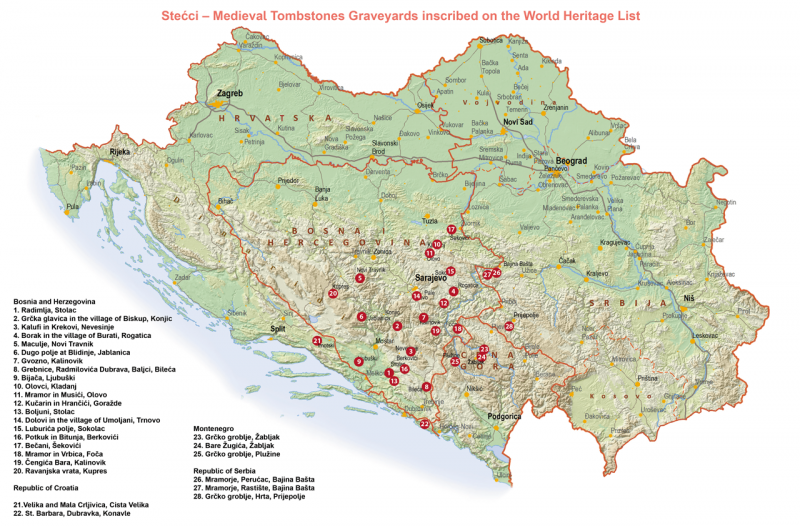 By the World Heritage Committee’s decision (40 COM 8B.24) 28 necropolises with stećci on the territories of 4 states were inscribed on the List (20 in Bosnia and Herzegovina, 2 in Croatia, 3 in Montenegro, and 3 in Serbia). This serial transnational property includes a selection of 4,000 medieval tombstones (stećci) which were chosen based on the state of preservation of the monuments, preservation measures applied in the countries on the territories of which necropolises with stećci are located, and visual-aesthetic criteria relating to the position of necropolises in a natural or other type of environment. The necropolises with stećci inscribed on the World Heritage List, their archaeological and historical context, the variety of types of tombstones and ornaments, as well as the contents of their epitaphs have preserved the highest level of authenticity in comparison with other stećak necropolises. They represent the best preserved and original artistic expression of this kind of medieval sepulchral art. All 28 selected necropolises with stećci, which are the component parts of this serial transnational World Heritage property, contribute to the understanding of the outstanding universal value of the stećci. The Statement of Outstanding Universal Value for the World Heritage property Stećci-Medieval Tombstones Graveyards was adopted by the World Heritage Committe at its 41st session in Krakow in July 2017 (Decision 41 COM 8B.49).